Plans are well underway for this year’s Palm Sunday, “Welcome Refugees” rallies. 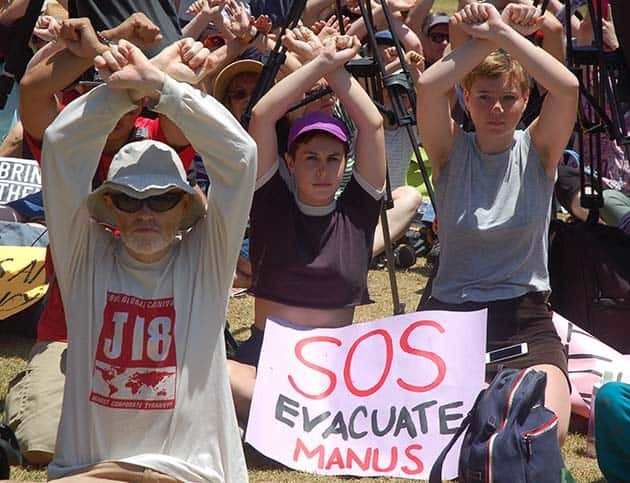 It is more important than ever that thousands rally and march to demand the closure of Manus and Nauru, an end offshore detention and that all the asylum seekers and refugees are brought to Australia. The injustice and misery has to end. The conditions on Nauru and Manus continue to deteriorate. Border Force’s sick determination to maintain its offshore detention regime is seeing it condemn children to the mental hell of Nauru rather than allow them to get help in Australia. On multiple occasions it has refused to bring psychologically damaged, suicidal children off Nauru until lawyers take them to court. And there are scores more people that Border Force has prevented getting help despite medical recommendations that they need treatment that Nauru cannot provide. Border Force has now negotiated an arrangement to send medical patients to Taiwan, to prevent having to send anyone to Australia, where legal action can prevent them being returned offshore. The Rohingyan refugee who Border Force refused to medivac after he was severely head-injured last November still suffers severe headaches and is too dizzy to walk very far. He has received no treatment. It takes refugees four days to get an appointment to see an IHMS doctor at the clinic that now only operates at the East Lorengau camp during office hours. Otherwise refugees have to use the Lorengau hospital, which struggles to provide even rudimentary health care for locals. And refugees are still exposed to violence. They are warned to “walk in groups” and be back in the camps by 6pm. Meanwhile, the US resettlement process is glacially slow, and uncertain. Four and a half years after they were dumped offshore and 15 months after the US deal was announced, hundreds of people have not even had their first interview. Others have completed security interviews and had medical examinations in preparation for resettlement months ago but have no idea when, or if, they will ever go. Iranian refugees are conspicuously absent from recent US resettlement approvals. After three protests on Nauru, Border Force gave them a letter, which said almost exactly nothing. “No nationalities are excluded from the US Refugee Admissions Program” it claimed but, “Nationalities [unspecified] subject to a Security Advisory Opinion may require more time to process.” More time than 15 months? It didn’t say. But it did say, “Further visits from the Department of Homeland Security are planned in the coming months.” Months! A January ReachTel poll recorded 58 per cent in favour of the Australian government accepting New Zealand’s offer to take 150 refugees from Manus and Nauru a year. But even that idea is too much for Minister Dutton who constantly resorts to the old scaremongering about people smugglers, “watching developments in Australian politics closely”. Like the lies about “African gangs”, refugees are part of the government’s suite of racist election propaganda. The Liberals’ scapegoating will increase as the election gets closer. That is an added reason to build the biggest Palm Sunday rallies that we can, with the biggest union contingents we can organise. We need to get rid of the Liberals. But Labor remains committed to offshore detention. The movement to “Bring Them Here” has to grow over the coming months—to take the fight to Turnbull but to also make it clear that the movement won’t settle for anything less from a Labor government. It is a demand to immediately end the misery on Manus and Nauru. Along with ending asylum boat turnbacks, it is also a demand that goes to the political heart of the refugee movement—the right for asylum seekers to cross borders by boat and be protected when they arrive. The ruling class wants to maintain their borders to divide and rule and assert their control. Fighting to “Bring Them Here” is part of the fight that can break that control.